Other Products: White Cardstock, Big-Shot Machine. Sequins, Gold cardstock. Instructions: Card size 6"x6. (White cardstock). Take gold cardstock and cut it into size 5.875" x 5.875" and stamp with Delicate Pansy Spray with archival ink-Manganese Blue on the top left and bottom right side as shown and adhere it on the card base. Cut three layer of eyelet diamond die on white and gold cardstock as pictured. 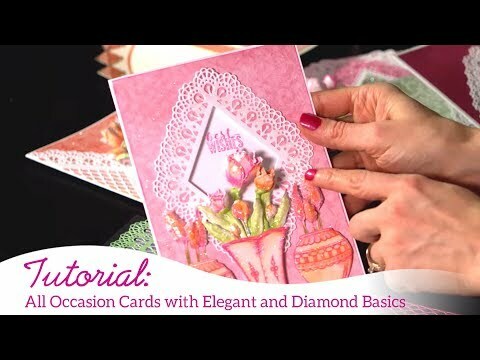 Cut one Ornate Pocket Accents Die on white cardstock and arrange the die around eyelet diamond die with Designer Dries Clear Adhesive and foam tape for eyelet diamond die. On the top layer of eyelet diamond die, stamp the sentiment with archival ink-jet black from For My Friend Sentiments Cling Stamp Set. Stamp some Cheery pansy flowers and leaves with archival ink-Majestic Violet and library green and cut them with coordinating die and color them archival ink and Zig Clean Color Real Brush Markers. Shape them using the Pansy Shaping Mold and assemble them. Add prills to the centre of the flower and sprinkle crystal clear glitter and arrange these flowers and leaves as shown. Adhere a few sequins to decorate the card.